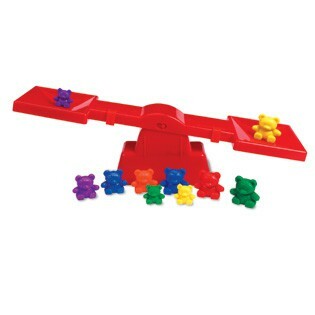 Let the Three Bear Family® weigh in with this simple see-saw balance! A visually engaging and tactile way to introduce mass and measurement, this set includes 10 bear counters and a multilingual Activity Guide. Balance arm snaps into place, and sliding compensator clips calibrate for easy use. Measures 15.75" x 4". Ages 3-8. From Learning Resources.